It's not another space race. Private space companies want to send humans where none have gone before. Big-picture thinkers like Elon Musk, Jeff Bezos, and Richard Branson are developing spacecraft that can take tourists into orbit around the Earth, to vacation on the Moon, or even to build settlements on Mars. If you’ve been paying attention to this burgeoning industry (or even if you haven’t), SpaceX is hard to ignore. The high-profile company has completed more missions than any of its competition. Since its first demo flight in 2006, Elon Musk’s brainchild has launched a handful of commercial satellites into orbit and completed 45 missions total, according to the company’s launch manifest. And the company has another 70 missions planned, totaling in $10 billion in contracts. It’s one of the world’s most valuable privately-held companies. The company’s Falcon 9 rockets are also reusable, dropping the price of each launch by up to 30 percent, or $18.6 million per launch, SpaceX’s president estimated last year. Technology still under development, such as the Dragon capsule, the Falcon Heavy rocket, and the BFR rocket system are essential to reaching one of Musk’s most clearly-defined goals for the company: to put humans on Mars. These new technologies will also propel SpaceX even farther forward as the other companies work to reach milestones that they passed long ago. Some have begun to speculate that the company is doing so well that it’s edging out its competition. Because the industry is so new (and so expensive), could it, or any other company, become a monopoly? Answering these questions — understanding what the future of spaceflight will look like, and who the main players will be — ultimately requires a look at the history and origins of humanity’s journey into space. Since the beginning of the space program, NASA has worked with private companies to bring its projects to fruition and to meet its goals. Even so, federal law prohibited private companies from launching their own satellites until 1984. Suddenly, the U.S. government untethered a huge block of federal funding from NASA, and private companies quickly began to fill the void the historic shuttle program left. Before 1969, the United States and the Soviet Union faced off on a singular goal: to be the first nation to put a human on the Moon. Today, many more organizations are launching into space, and with a diverse array of goals. In 2000, Jeff Bezos, the CEO of Amazon, founded spaceflight company Blue Origin, which has focused most of its resources on creating technology capable of ferrying tourists into space. In 2015, Blue Origin became the first private spaceflight company to successfully launch and land a reusable rocket. 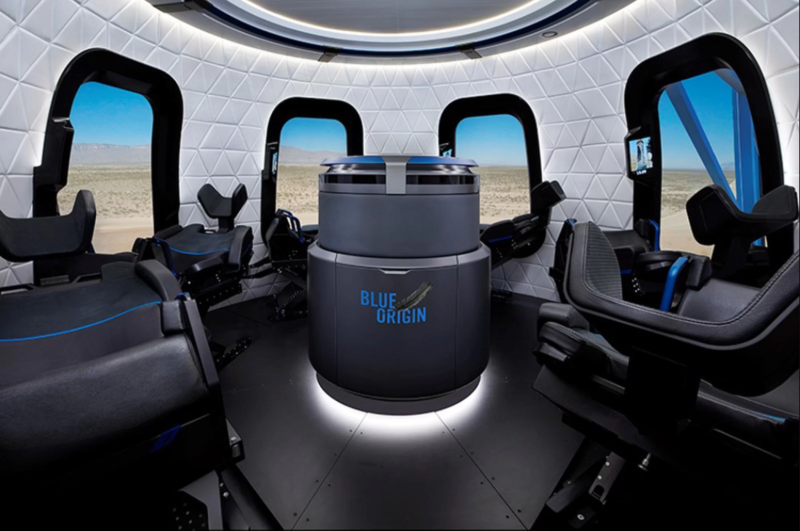 Blue Origin recently released new photos of its New Shepard passenger capsule and rocket, and the company hopes to carry out its first consumer flights in early 2018. Billionaire Richard Branson’s Virgin Galactic is also dedicated to space tourism. “Our purpose is to become the spaceline for Earth; democratizing access to space for the benefit of life on Earth,” the company’s website states. Elon Musk is less focused on space tourism (though he does plan to send two paying tourists to orbit the Moon), and more on getting humans to the Moon and to Mars. In September, Musk announced plans for SpaceX’s “BFR” rocket, which he plans to send to Mars. But the same one could also put humans permanently on the Moon. Speaking at the International Astronautical Congress (IAC) in Adelaide, Australia, Musk said, “It’s 2017. We should have a lunar base by now.” Putting human settlements elsewhere in the solar system could benefit us all, Musk’s logic goes — we could advance economic interests by developing space mining, or decrease the burden of overpopulation on an increasingly-crowded Earth. Each company may have a slightly different goal and a different way to achieve it, but it’s clear that SpaceX is disrupting the burgeoning private space industry, John Logsdon, founder of the Space Policy Institute and professor emeritus at the Elliott School of International Affairs at George Washington University, told Futurism. “SpaceX has been able to offer a standard service that is placing satellites in orbit at a lower price [than its competitors] and with acceptable reliability,” Logsdon said. 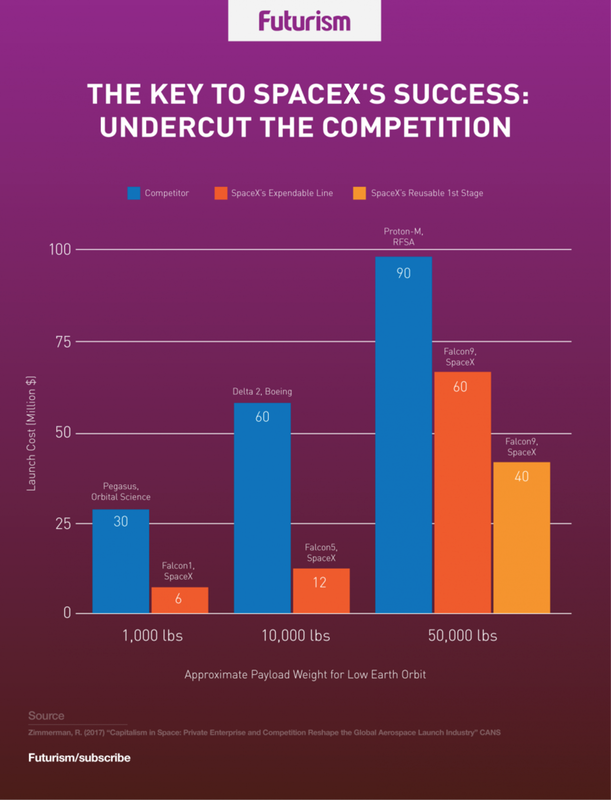 The key to Logsdon’s assessment ultimately depends on understanding the sheer size of the space industry and the excessive rate at which it is expanding. The petty squabbling of billionaires looking to one-up each other is just the side-show to the main event: the advent of reusable spacecraft. All of these tests on individual rockets allow the scientific minds behind the scenes to work out the kinks that will eventually bring us the true next generation of space travel, one in which spacecraft are reusable, cheap, and available to anyone. Of course, these innovations will provide benefits beyond simple space tourism and will assist many other avenues of business. In fact, they already are. Reducing the cost of launching satellites makes it more accessible to small companies with limited resources that might be looking to explore space, do scientific testing, or launch their own communications networks. Finnish observation satellite company ICEYE is one such organization preparing to launch a global network of Earth-monitoring microsatellites. To do that, the company is using rockets made by others. “With small satellites, you tend to do what’s called a rideshare, meaning that there is a rocket that is then shared by a large primary payload. This is really a way that a lot small private space companies are able to access space with non-governmental budgets,” Pekka Laurila, CFO and co-founder of ICEYE, told Futurism. Financial costs aren’t the only thing Laurila considers before such a launch, however — reliability and time all add up, he said. And because the company may want to launch satellites into a less-trafficked area of Earth’s orbit, that ridesharing may be more challenging. And though it may be leading the race, SpaceX might not be the right fit for companies like ICEYE because it offers such large-scale services; smaller launch companies that are able to learn from SpaceX’s successes and failures can fill in the gaps. “In these type of situations, we would definitely be looking toward working with a small launch provider like Vector Space Systems, for example,” Laurila said. Put in this light, Logsdon’s statements make sense. SpaceX may be a massive force in the world of space exploration, but given the diverse array of needs across industries, it is unlikely that they will ever be the only contender in the race. Of course, that’s not to discount SpaceX’s contributions. “Lowering the price of access to space is certainly an important development, and SpaceX has led the way in doing that,” Logsdon said. But organizations that prioritize other forms of affordability and accessibility will likely have their share in the fray. Whether technological innovations are spurred by competition or collaboration, all of humanity will reap the benefits from the enhanced understanding and capability that space travel will undoubtedly bring us. SpaceX may not be monopolizing the landscape, but it is setting a standard against which its competitors, small and large, must measure themselves. We’re not witnessing another space race, we’re enjoying the rise of a new industry, one in which there are many winners emboldened by the success of giants.